I love when desserts are as fun to look at as they are to eat. Especially for a party it is almost as important for them to look good as it is for them to taste good. 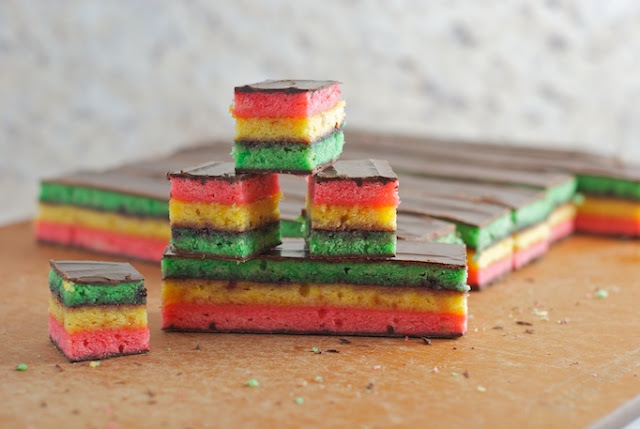 If the colors alone in these seven layer cookies weren't enough to make you fall in love, the layers of preserves and chocolate are sure to win you over. I don't know about you, but I cam envisioning a red white and blue version for the 4th of July. You can get the 7 layer cookie recipe and check out how to create them over at Heather Handmade.